The LSAT is many things, but cutting edge it is not. It knows the LSAT is pretty darn predictive, so there’s no apparent interest in switching from paper and pencil to a computerized format. And you still need to use a #2 pencil – and mechanical pencils are even a no-no! But, this past month we see that LSAT has finally upgraded their website. Congratulations, LSAC! The features are more or less similar – a file moved here, a sample test gone there – but one thing that will interest folks who like to stay up late wondering what are the chances of getting into Columbia with a 3.5 and a 172….It was always on the LSAC website, but it was deeply buried and wasn’t so pretty. It used to feel like something dirty and forbidden! LSAC realized what we all want to do all day between practice tests! Should I Take the October LSAT? 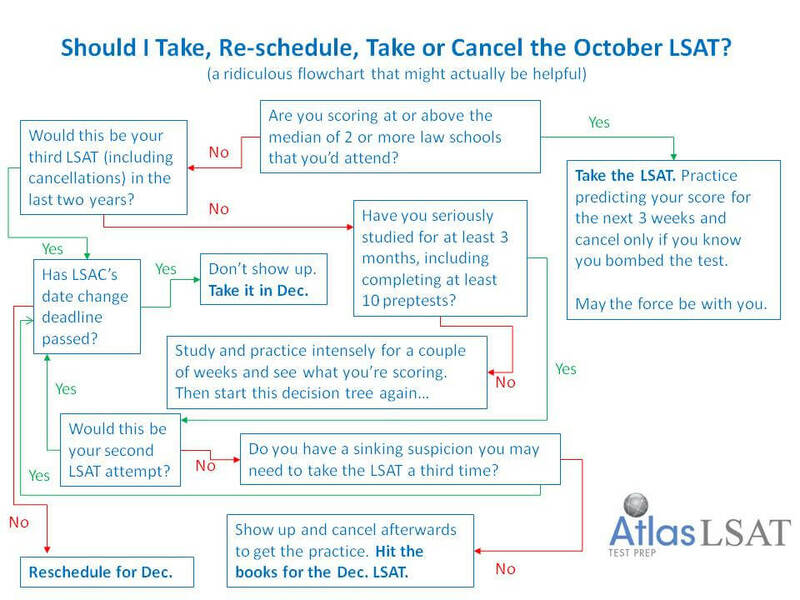 With just 3 days left to decide whether to take the October LSAT, some folks are pulling out their hair. So, for your flow-charting pleasure here’s a guide to making this decision…To be taken with a grain of salt, especially if the schools you care about take your higher LSAT score, no questions asked. If that’s the situation, the issue is mainly whether you have more attempts available.